Am 12. Dez. 2013 zeigen Asbjørn Levring (DK) und Odilo Schoch (CH) in der Schweizer Baumuster-Centrale Zürich welche Mehrwerte durch BIM in Entwurf und Planung erzielt werden können. Beispiele aus Dänemark veranschaulichen die Konzepte. Asbjørn Levring’s Grusswort: „I am happy to present how we create value for Danish and international companies using BIM technology. During my work at the Danish Technological Institute I helped software companies, architects, engineers, building owners and manufactures to get added value in BIM by using strategy-based implementation. My key learning is, that we have to make it simple and easy to get to a broader attendees in construction. We enable the potential in BIM by software customization and methodology development. 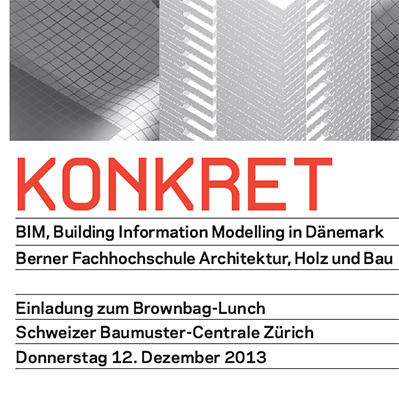 In our lecture, Odilo and I will show the benefits of BIM in early design, design development and detailed design phases. We will present you the ability to implement effective processes and value based strategies using a multiple tools approach to add all aspects and new possibilities into your own process from day one. In addition I will present predefined workflows for environmental simulation, cost estimation, virtual planning and visualization of important design parameters. Referenten: Asbjørn Levring, Odilo Schoch. 12. Dez. 2013, 12:15 – 13:30 Uhr, kostenlos. Ort: Schweizer Baumuster-Centrale Zürich, Weberstrasse 4, CH 8004 Zürich. Die Präsentationen sind auf deutsch und Englisch.